Unfortunately for fans, he may also have the distinction of directing the last film that Ghibli will release. 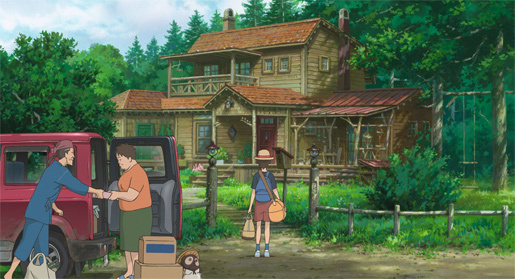 When Marnie Was There is based on English author Joan G. Robinson’s novel, one of Hayao Miyazaki’s favorite children books. I suspect the book was set in England, but the movie is set in Japan. The film was made in Japanese, and is now available in both a subtitled version and an English dubbed version (starring Kathy Bates, John C. Reilly, and Kiernan Shipka, among others). I reviewed the subtitled version. As told by Yonebayashi, the protagonist is a Japanese city girl named Anna. Anna is a loner who spends her time sketching. After an asthma attack, a doctor prescribes country air, and Anna is sent to a rural seaside to live with an aunt and uncle. What’s most striking about 12-year-old Anna is her depression. At the doctor’s office she apologizes to her mother for “costing her money, again.” Her isolation from the other children seems like a terrifying combination of shyness and low self-esteem. And early in the film she says things like “I hate myself.” It’s a bit shocking, especially if you’re expecting something Disneyesque. It’s also refreshingly honest, and I imagine there are depressed kids who will be secretly thrilled to see someone like themselves on screen. As Anna gets to know her new surroundings (“smells like a stranger’s house”) she falls in love with an abandoned mansion across the bay from where her aunt and uncle live. At low tide she can walk there, and at high tide you’d need a boat to get there (or back). Anna dreams — and sees — a girl in the window of the mansion: a blond, blue-eyed girl having her hair brushed by an older Japanese woman with gray hair. Eventually Anna meets this apparition, a very real girl named Marnie. They become friends and promise to remain each other’s secret forever. You can read homosexuality into it if you so choose, but Anna and Marnie are just a little too young to be thinking about romance. The mysterious nature of Marnie’s existence is revealed in due course. Meanwhile, Anna goes out every day with her sketchbook, making friends with the other outcasts in the small village. The mute fisherman Toichi is still mocked by the village’s children, but he will row Anna across to the mansion or take her out to sketch while he fishes. A middle-aged woman named Hisako often sets up an easel and paints the old mansion across the bay. And the well meaning mother of a fat girl in the village tries to arrange a “normal” play date between Anna and her daughter. Later in the film, Anna meets Sayaka, a girl of about 10 from Tokyo. Her parents are moving into the old marsh mansion and renovating it. The great films from Studio Ghibli are about place, and When Marnie Was There honors that tradition. The rural location is simple and beautiful, rustic but not run-down. It seems to be June — when everything is newly green and lush. The “marsh” of their village is a beautiful bay, which Anna’s room overlooks. There is a corner store by the town mail box, and that seems to be the extent of the village, except for the temple where everyone gathers one warm night for a festival that involves trick-or-treating. The mysterious story seems a little predictable, but maybe it’s just because the novel has inspired lookalikes. In any case, what I like best about When Marnie Was There isn’t necessarily the story, but the characters and settings. By the end, Anna’s depression fades. Many things seem to have helped: the lovely setting, solitude, and finding a friend who offers unconditional love. Being able to help a friend in need makes Anna realize she is not worthless. It also helps that the dark secrets from her early childhood are brought to light and put into a proper context. Therapy, kids. That’s the answer. For me, the answer is to travel to yet another lovely Ghibli setting — possibly the last — and get lost in it.